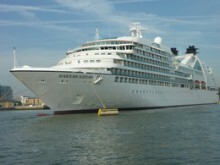 The Yachts of Seabourn’s highly anticipated new yacht Seabourn Sojourn navigated the River Thames and arrived at London with the early morning sun on Friday, 4 June 4 2010. Built by the T. Mariotti shipyard in Genoa, Italy, Sojourn is the second of three new luxury cruising vessels joining Seabourn’s fleet in three years, representing a 216 percent increase in capacity for the company. We are very pleased to introduce Seabourn Sojourn to London and to the world, said Pamela C. Conover, Seabourn’s President and CEO. She is a beauty inside and out, offering luxurious accommodations, the finest cuisine and gracious, personalised service along with a sleek and stylish design. Sojourn will provide the exclusive and intimate experience that Seabourn is known for and our guests have come to love and enjoy, she continued. The 225-suite yacht offers an extraordinary travel experience, notable for its relaxed, sociable ambiance and highly personalised, intuitive service by nearly one staff member per guest. Sojourn also offers the highest space-per-guest ratio in the industry, accommodating no more than 450 guests in spacious, ocean-view suites, 90 percent of which have private verandas. Top of the range suites include Grand Wintergarden Suites, offering 1,403 square feet of indoor and outdoor space; two bedrooms and bathrooms; a private, glass-enclosed solarium with tub and daybed; dining for six; two bars; whirlpool and three flat-screen televisions. All suites feature separate living areas and bedrooms, writing desks with personalised stationery, iPod and MP3 connections and spacious granite bathrooms with separate bath and shower and twin sinks. 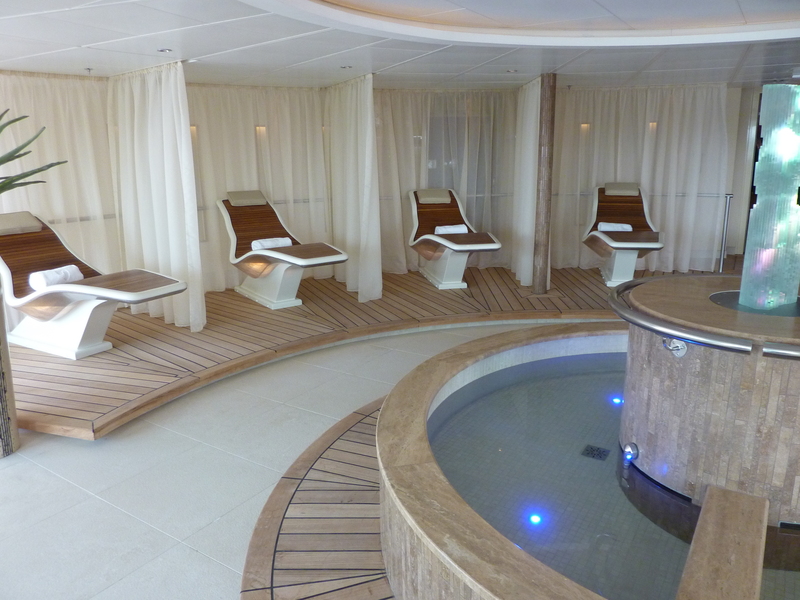 The largest spa on a luxury vessel, the two-deck Spa at Seabourn provides the ultimate pampering experience at sea. Exceptional new amenities in the 11,400-square-foot spa include a Kneipp Walk, a herbal bath facility and an aroma steam bath with salt inhalation. For pure indulgence and relaxation, guests can reserve the canopied Spa Villa, with a whirlpool big enough for two, a private balcony for sunbathing, a double daybed and a full living room. To satisfy gourmands, Sojourn offers culinary experiences in its four dining venues that rival the finest restaurants anywhere. Guests will savour five-star dining at The Restaurant, with menus created by celebrity chef Charlie Palmer, or enjoy innovative small-plates tasting menus at the avant-garde Restaurant 2. Both the indoor/outdoor Colonnade and casual poolside Patio Grill serve breakfast, lunch and dinner. Guests can also enjoy meals from the Restaurant menu, served course by course in the comfort and privacy of their suite or on their veranda during extended service hours. The dining venues, as well as the six bars and lounges, serve a full range of beverages, including fine wines and spirits, with Seabourn’s compliments. Other highlights include two outdoor swimming pools, six outdoor whirlpools, and water sports from the unique fold-out marina. Located on the top deck is The Retreat, featuring a contoured nine-hole mini golf course, a giant chess board, shuffleboard and stargazing in the evening. On Deck 7 is Seabourn Square, an innovative “concierge lounge” with a library, upscale shops, outdoor terrace, computer center and coffee bar. Sojourn was moored mid-river for two days of inaugural celebrations on 4 and 5 June 2010. 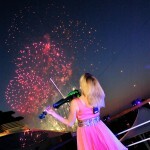 British supermodel and fashion icon Twiggy officially named the vessel during a glittering ceremony on the evening of 4 June 2010. The following day, the company donated Sojourn to the non-profit organisation, Breast Cancer Haven, as the venue for a gala fundraising event to celebrate the charity’s 10th anniversary. On 6 June 2010, Sojourn began her maiden season from London, and is sailing 12- to 14-day voyages during the summer to the Baltic, Scandinavia, Russia, Norwegian Fjords, and Scotland, as well as several Mediterranean voyages in the autumn. Following a 12-day transatlantic cruise, the yacht will operate a series of Caribbean voyages in the winter from Fort Lauderdale. On 5 Jan 2011, Sojourn will embark on a world cruise from Los Angeles to London via the South Pacific, New Zealand, around Western Australia, Indonesia and Southeast Asia, India, Arabia and the Mediterranean. 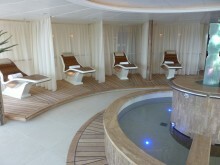 Special Fares for the full 111-day world cruise can be provided by Deluxe Cruises.